If you are looking for a complete guide to getting started with Zune game development then you don’t need to look any further than the XNA website. I’m pretty excited about being able to play games on my Zune but being able to easily make games is almost as exciting for me. There’s a lot of information about how this works out there (that Adam was nice enough to send my way!) and between the tips for all of you potential developers and the games that are available for download, there’s something for everyone already and this stuff isn’t even live yet. 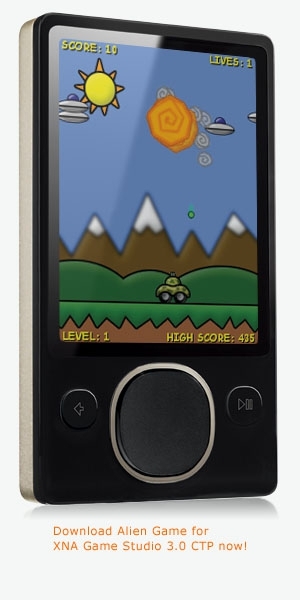 I’m pretty busy but I I’d really like to try and make a game of some sort for the Zune. I’ve always been a huge fan of turn based strategy games so I’ll have to see what it’s like to develop for XNA. At the very least you can expect a truly awesome “Hello World” application from me!